The Mansion in Santa Teresa will host a twelve-hour long pool party, with a special attraction of DJ Sam Feldt to make the event an epic end to Carnival 2017. 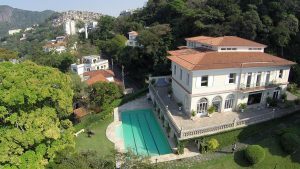 RIO DE JANEIRO, BRAZIL – Renovated Portuguese colonial house, The Mansion in Santa Teresa, will host its final event of the 2017 Carnival celebrations on Tuesday, February 28th. The space will host a twelve-hour long pool party, with a special attraction of DJ Sam Feldt to make the event an epic end to the greatest party on earth. The Mansion will host a twelve-hour long pool party, with a special attraction of DJ Sam Feldt to wrap up Carnival 2017, photo internet recreation. Upon arriving guests will be enchanted by The Mansion‘s ample space, and the classic ambiance adorned by works of modern art. Adding to the aura, it is surrounded by native flora and fauna of the Atlantic Forest with amazing views of Guanabara Bay, Sugarloaf Mountain and Christ the Redeemer. The White Pool Party by Grey Goose featuring Sam Feldt will have a theme of – naturally – wearing all white clothes for the day and night, and for those contemplating the transition from pool party to evening wear, The Mansion offers plenty of bathrooms to change in. “Everyone should wear white clothes and the pool will be open. All this to the sound of DJ Sam Feldt with his super hits and another group of incredible DJ’s,” she explains. Tickets should be purchased online prior to the event, priced at an R$80 for women and R$100 for men (with open bar until 5PM). *This is a sponsored article for The Mansion.